Our turn-key PremierSign system has helped retailers, museums, healthcare facilities, municipalities and corporations strengthen their image, attract and inform customers and train their employees. Many of these organizations are using digital signage to inform, promote and cross-sell products and services directly to their captive audiences. 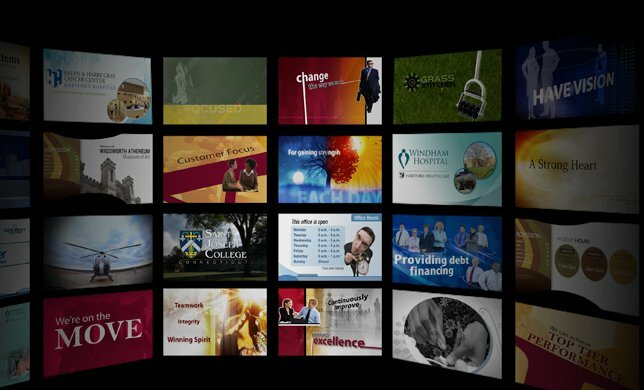 From consultation to delivery we are a full-service digital signage provider. No ongoing licensing fees, quick turnaround, on-site maintenance and training are a few of the benefits of selecting us for your digital signage project. Our expertise in dynamic content creation and attentive customer service has build lasting customer relationships. Call us today or e-mail us for more information. Click here to download our PremierSign brochure.